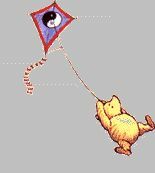 Last night I taught 2 people how to fly sport kites. Both had flown power kites before, so it wasn't too hard. rewarded in maximum Karma points. teach my friend how to fly?" I turned around to see a tanned, well toned, 6' tall Nordic blonde. Looks like you had your hands full! Nice set of photos John. Interested to see your impressions of the HQ Jive 2. I felt that it didn't feel quite right out of the bag, rather nose heavy, and I've spent over a year trying different things. Mine will now do axels, 540's, flic flacs, nice stable fades, slots, taz's ( when I get it right) and it loves JL's, it will do those all day, in fact most tricks are possible. If anyone has one and wants to know how to trick it up I can tell them. A lot of the first batch of Jive 2's came out with the bridle set up incorrectly. Mine came as a 3 point when it should have had a turbo! Easy fix. It should look like this. The bridle was stock with a short turbo leg. "Here let me put my arms around you"
John, being an engineer and your attention to detail I'm sure that you said that she should come back for further training so that she has the finer points of flying down correctly. "oh no, that's my line winder"
It can take hours of instruction to start mastering the world of freestyle... not to mention the details of flying in different wind ranges and new locations. Lastly, have you offered to introduce her to the world of photography? which end of the camera?